Hundreds of Samsung apps for Samsung Smart TVs are available, but which are the best must-have apps for 2019? You get the obvious streaming video apps with Netflix, Vudu, Amazon, and Hulu Plus included on Smart TVs, but other types of apps your TV are out there. You might be surprised at what you'll discover among the many apps available. Some apps are quite useful, and game apps can be fun, whether you're playing against the system or with friends. Here's a list that will help you decide which ones you might want to try out. Tons of videos covering a variety of topics. Compatible with many Samsung TVs. No mainstream movies or television programs. If you enjoy TED Talks, now you can watch them from the comfort of your couch or favorite chair using the TED app. The app is free. You have access to more than a thousand videos of business leaders, musicians, techies, medical experts, and many more who offer enlightening insights and perspectives on a great range of topics. Lifestyle forecasts are handy for special interests. App has had some buggy issues in the past. Two Accuweather apps are in the Samsung App store — one paid, one free. The free Accuweather app might be all you need if you live in one of the larger cities listed in the app. For those who live outside the listed cities, the paid Accuweather app ($2.99) displays forecasts by specific cities and zip codes. It shows 10-day forecasts, satellite views, and hour-by-hour weather maps. The app also provides weather warnings. This is a complete weather app that is easy to navigate and easy to read at a glance. Movie ratings from Rotten Tomatoes and Flixter. Large selection of movies for rent or purchase. Create a watchlist to track movies you want to see. FandangoNOW offers more than movie times and reviews. This is a full-on video-streaming service offering access to more than 30,000 movies and TV shows without a subscription. Fandango purchased the M-Go service and built upon it to create FandangoNOW. If you used M-Go, all of your purchases will be available on FandangoNOW. Though the app is free, content is available for rent or purchase. Purchases made through the FandangoNOW app will earn you Fandango VIP points that you can use for discounts on future purchases. Tons of how-tos on a variety of Samsung devices. Does not work on all Samsung devices. How-to videos may not cover older devices. This app offers video tutorials for all Samsung products from cell phones and computers to TVs and more. You'll learn the basics of the device as well as how to get the most out of it. Videos include how to connect your Blu-ray player to the internet, how to troubleshoot your Samsung washer, how to create macros on your Samsung TV remote control, and dozens more. View online web shows and podcasts. Upload your own movies, music, photos, and more. Requires a paid subscription for movies and TV shows. Some videos buffer during play. 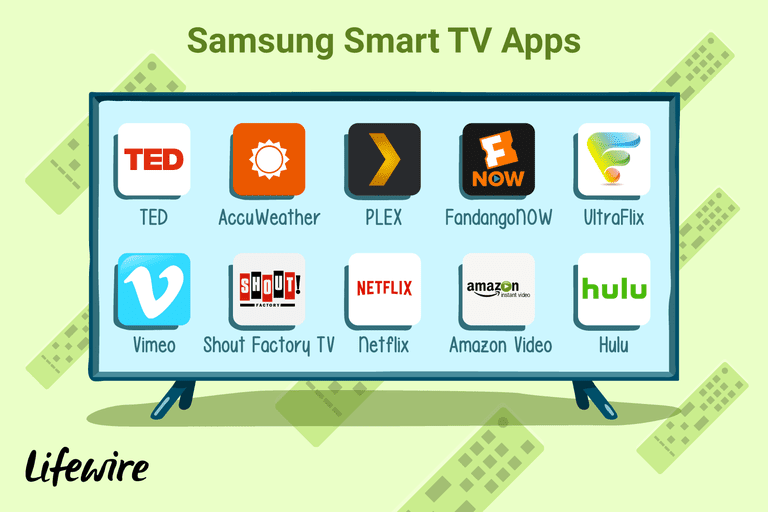 PLEX provides a way to organize your content so that it can be easily accessed on your Samsung smart TV. This gives you the ability to play any compatible media content that's stored on your computer on your TV. You just have to make sure that you have the PLEX app installed on your TV, and the PLEX media server software installed on your computer. Once you have the app and media server installed, you're ready to go. The basic app is free, but you can upgrade to PLEX Premium ($4.99 mo, $39.99 yr, $119.99 lifetime). This lets you watch and record live TV on your computer or in the cloud (antenna and tuner required, as well as the ability to sync your content with compatible mobile devices). Decent selection of free movies to watch. Not a huge selection of content. Does not support surround sound. Available only in the US, Canada, and Europe. If you have a Samsung 4K Ultra HD TV and can stream in 4K, then check out UltraFlix for a host of free and paid 4K content. You can rent many movies for $4.99, usually with a 48-hour viewing window. Content offerings, some in HDR, change periodically. You need only a 4mbps to 5mbps broadband speed. Has an On Demand feature where you can rent or buy movies. Interface is a bit sparse. Doesn't provide much information on the videos. Everybody watches YouTube, but that isn't the only source of free, original, uploaded video content. Vimeo offers thousands of videos from many sources, including aspiring amateur filmmakers. The best way to get started is by checking out Vimeo's staff picks. Categories include music videos, short documentaries, comedy, and more. Tons of classic movies and television. No current TV shows or movies. No ratings to help you make selections. If you are a cult TV and movie fan, this is the app for you! Shout Factory TV provides access to great content such as select Roger Corman films and sci-fi classics such as A Boy and His Dog and Dreamscape. If you like classically "bad" movies, check out collections from Elvira's Movie Macabre, Mystery Science Theater 3000, and Rifftrax. You can even binge-watch old TV shows such as Father Knows Best, Dennis the Menace, even Super Sentai (the original Japanese Power Rangers). There's also plenty of original programming and other special content. Watch it all for free. The only downside is that titles move in an out periodically, so if you find something you like, watch it while it's there. Shows the date and time. Interface is a bit basic. Hasn't been updated for several years. This app can help you start your day in the morning. On the left is a large digital clock and calendar so you can see what day it is and stay on time. The center section of the screen is an hour-by-hour weather report for the day — helpful when you're deciding what to wear to work. On the right side of the screen is a local map with traffic so you'll know what time you need to leave.